VertaseFLI was appointed to carry out knotweed clearance work in advance of large scale in-situ bioremediation work, at the former Powell Duffryn Oil Storage Depot and Coal Yard in Purfleet, Essex. The works comprised primarily the excavation and removal of severe infestation of Japanese Knotweed from several areas of the site including difficult areas where there was penetration by rhizomes around buried pipes, wall foundations and slabs requiring careful excavation. The site was bordered by a major mainline railway on one side and the river Thames Flood Defence Seawall on another, requiring special precautions and care when excavating in the vicinity of these sensitive structures and operational areas. The site had a history of oil and petrochemical processing, and storage and exhibited areas of extreme contamination. Consequently and contrary to the usual knotweed contracts undertaken by VertaseFLI, it was found that a significant amount of the knotweed infested soils were dug from areas of severe hydrocarbon contamination and these had to be carefully separated from uncontaminated soils. The contamination was severe enough to class the soils as hazardous and the non-hazardous landfill usually able to take knotweed was unable to accept it in its contaminated condition. 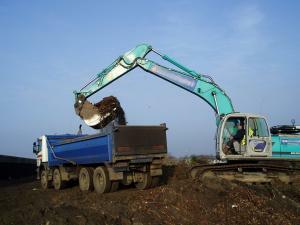 Alternative hazardous soil disposal was considerably more expensive so VertaseFLI treated the material on site thus offering a significant saving to the client. 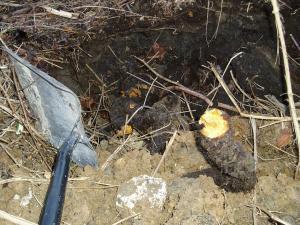 Following completion of ex-situ bioremediation, the knotweed infested soil was acceptable to a non-hazardous landfill for disposal. Our extensive track record of successful projects over many years speaks for itself.